Is LED Landscape Lighting Really Worth the Cost? Go Back to the Homepage / Is LED Landscape Lighting Really Worth the Cost? Light-emitting diode (LED) bulbs have taken the lighting industry by storm and for good reason. In this post we’ll discuss the energy use of the LED bulb versus the halogen bulb, and why that’s a contributing factor in cost. We’ll also provide some figures to help you determine the long-term cost of a system powered by LED versus one powered by halogen. LED technology has been around for a long time. It’s earliest use was limited to infrared devices and the common remote control. As more capabilities were discovered, it began being used in Christmas lights and alarm clocks until it became what we know it to be today. These powerful little diodes use a built-in semiconductor to emit light using the electric current provided by the source such as a plug or outlet. What makes LED a breakthrough in the lighting industry is that it converts 95% of that energy (electric current) into light, leaving only about 5% to be wasted as heat. In comparison, halogen models may convert as little as 15% into light and lose up to 85% as heat. 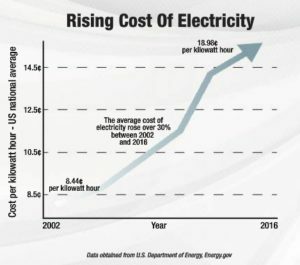 As an example, if you have a landscape lighting system with (30) light fixtures your annual electricity cost of (30) LED bulbs would be $82.80 compared to (30) halogen bulbs at an annual cost of $579.60. That’s just to provide power to them and doesn’t take into consideration life-span or replacement needs. One of the other pros of LED bulbs is their durability. At Total Sprinkler & Lighting, we exclusively use Brilliance LED bulbs because they have a 50,000 hour guarantee and a 5-year warranty. Say you run your system for 8 hours each night, and you’re running it every night, or 7 nights a week. In one week your bulbs are providing light for 56 total hours (8 hours x 7 nights = 56 total hours). In a year they will run for 2,912 hours (56 hours per week x 52 weeks = 2,912 total hours per year). With a 50,000 hour guarantee, your LED bulbs will be providing light throughout your outdoor areas for 17 years! How does that stack up against halogen? They have a lifespan of about 1.5 years. During the 17 years that you never have to replace an LED bulb on your system with 30 fixtures, you’ll buy approximately 330 halogen bulbs. During a conversion from halogen bulbs to LED bulbs, the only replacements necessary are the bulbs themselves. Every other aspect of the system remains the same. So why isn’t everyone using LED? Most people tend to miss the big picture because an LED bulb costs much more than a halogen bulb. Your system with (30) fixtures will cost you about $1,155 in bulbs with an LED setup versus about $150 in bulbs with a halogen setup. This can be a tough number to swallow so keep reading. Remember that those halogen bulbs will need to be replaced routinely over the life of your system. Using the figures we mentioned before, over 17 years (the life of the LED bulbs), you’re going to spend $1,650 in halogen bulbs ($5 per bulb x 330 bulbs = $1,650 total cost in bulb replacements). That’s nearly $500 more than LED and it’s not the only cost. Consider the time changing each bulb and the hassle of a fixture that won’t come on because the bulb has burned out. When you pair crude cost numbers with cost of maintenance, it’s easy to see the ROI is higher on an LED system. 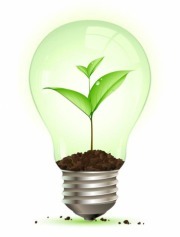 Total Sprinkler & Lighting cares for the environment. A lot. We recognize that technology changes quickly and new information is being produced rapidly. It is our ultimate goal to initiate a discussion with our clients using the most up to date and thorough data we can find. The figures presented in this article are reflective of that data. Every effort made on our part is in consideration of the larger whole. We hope you will consider it, too.